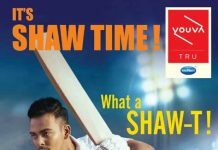 Neemrana: NIIT University (NU) has been recognised as one of the cleanest campuses in the country at Swachhata Ranking Awards 2018 for higher educational institutions, for its environment friendly and sustainable Green Campus at Neemrana. The award was presented to NU by Shri Prakash Javadekar, Honourable Union HRD Minister, Government of India. Dr Satya Pal Singh, Union Minister of State for HRD was also present on the occasion. Gen Ashok Kumar Singh and Air Commodore Kamal Singh received the prestigious award on behalf of NU. 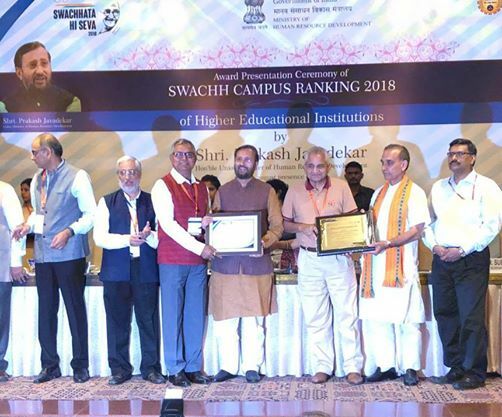 Swachhata Ranking Awards 2018 has been initiated by the Department of Higher Education to promote and reward cleanliness efforts of educational institutions. This year 6,029 institutions applied from which 205 institutions were shortlisted based on cut-off. AICTE & UGC inspected all 205 institutions and selected the best 51 institutions under 8 categories. NU ranked among top 10 residential technical universities. Established with a vision to bring about innovation in higher education and learning in emerging areas of the knowledge society, NU is a unique initiative where a campus is established on a comprehensive long-term master plan keeping environmental considerations at the centre. NIIT University has undertaken various initiatives to facilitate ecological resurrection and contain ecological degradation of its surrounding areas. To bring about a larger change, the university has also involved the local community in Neemrana to drive the initiatives. NU has adopted about ten hectares of nearby land for tree-planting. Almost 1 lakh trees have been planted so far using drip-irrigation. The university also has earth air-tunnels which act as enormous self-regulating heat sinks for the campus, with little electricity required to cool or heat the air. The earth air-tunnel installation harnesses wind chimney for a natural ventilation effect.